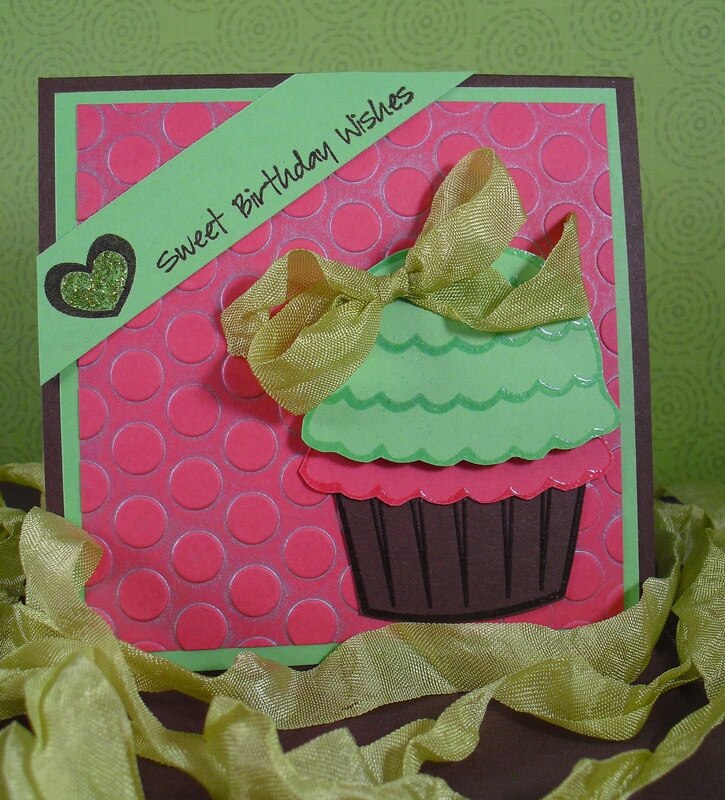 Made by Momo: Birthday Blog Hop in Honor of Samantha!!! Birthday Blog Hop in Honor of Samantha!!! I am so excited to be a part of this Birthday Celebration in honor of the awesome and extrememely talented Samantha! If you have just hopped on the tour, please go to the first stop on the hop at Samantha's Cricut Creations http://www.samanthascricutcreations.blogspot.com/ . If you have arrived from http://www.craftingwithcourtney.blogspot.com/ then you are in the right place. Thanks for hopping by! Here is a card I made using some fun techniques I have learned from my fellow crafters, I have been wanting to try them out and I finally got a chance to do it. I put some metallic ink in my cuttlbug folder for a distrssed inked effect. I used some of my NEW ALL TIME favorite crinkle ribbon that my awesome friend Meriah has been making and selling in the Pink By Design Store. Last but not least I have been wanting to emboss image stamps and cut them out as well as layer them. I just love the glossy effect from the embossing powder. (All stamps used are from the awesome Pink By Design Stamp Collection) Well I hope you like my card! Your next stop is the lovely Kim! CLICK HERE to hop! Super cute card Momo! I love the crinkle ribbon! Oh, yum yum, a cupcake with double frosting. How sweet is that!! The colors of your card are beautiful. And I just love the embossed background. 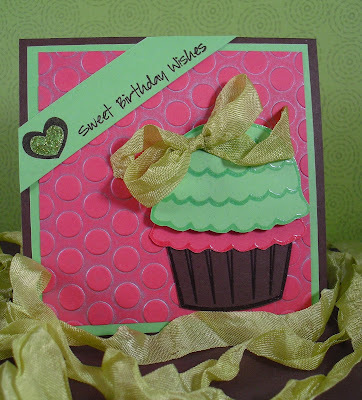 Cute card love pink and green together. thanks for sharing. WOW!! girl that cupcake looks delicious and good to eat!! Love the layers and color. That cupcake just pops out at you. Nice job with the layers and bright colors. Beautiful Card Love the colors and details! Cute little cupcake Momo! Great job. What a great card! I love the layers and details. TFS. What a great card!! Yummy enough to eat! I am a new follower! Super cute! Loving the colors! Love your cupcake and the colors are so bright. Great card and details:) TFS! Your card is yummy!! I love that embossing!! SO cute!! Awesome card! I love the effect of the metalic ink in the Cuttlebug folder. Were you able to get all of it out of the folder when you were done? Momo I love your card.You have taught me so much in the past couple of months.Thanks!!!! Oh this is awesome! Love all the details. TFS! cool card love the colors great job. thanks for sharing and thanks for the chance to win. I love all the texture and embossing!! :) Adorable cupcake. Love this card. I would like to learn how to put ink or powder to emboss. Interesting! Thanks for the inspiration. so adorable. i love the techniques you used! great job! Love this card and the colors. And also that ribbon from tattered times is awesome.